How many kinds of antibody can a human make by V(D)J recombination? An individual human produces many different antibody proteins, where “different” is amino acid sequence. How is this possible given that there are only a few “antibody” genes? Part of the answer is V(D)J recombination. An antibody is constructed from two pairs of polypeptides. Each pair consists of a light chain and a heavy chain. Each chain has a “variable” region and a “constant” region. The heavy chain is constructed from one gene (located on chromosome 14) while the light chain is constructed from two genes: the light chain locus \(\lambda\) (“lambda”) located on chromosome 22 and the light chain locus \(\kappa\) (“kappa”) located on chromosome 2. The variable region of both light chain loci is composed of a V part and a J part. The variable region of the heavy chain locus is composed of V, D, and J parts. A V, D, or J part consists of multiple copies of the exon that will be spliced into the mRNA but each of these copies has a slightly different nucleotide sequence and some of the copies do not produce functional mRNA. Choose one of the copies of the V region of the heavy chain locus. Choose one of the copies of the D region of the heavy chain locus. Choose one of the copies of the J region of the heavy chain locus. Choose one of the copies of the V region of one (either \(\lambda\) or \(\kappa\)) light chain locus. Choose one of the copies of the J region of the same light chain locus. combine with the C region to make the light chain mRNA. Finally, combine the light and heavy chains (these are actually translated independently and then joined into the protein but the math is the same). Figure 4.3 in this online textbook is a table containing the number of copies of each of the gene segments. 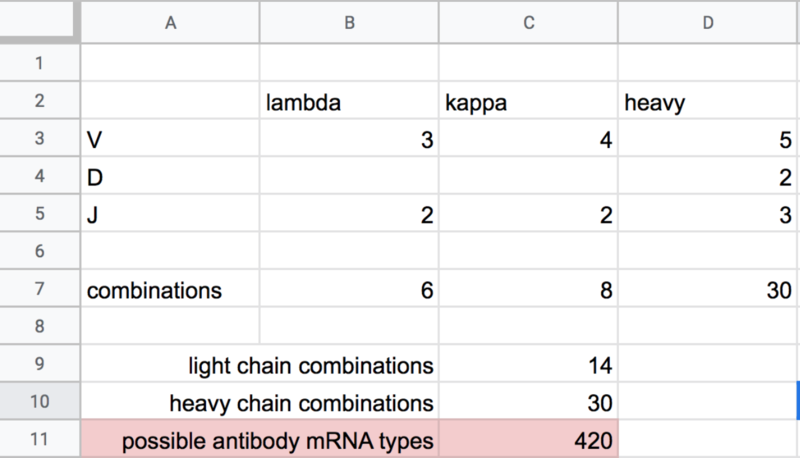 Use this table to compute the number of different antibodies that can be synthesized using V(D)J recombination alone.